During the month of December, GOOGL puked and then bounced hard along with the rest of the market. After a strong rally, the stock broke out of its downtrend, and I saw many people looking to get long the stock as the trend had changed. But I took the other side of the trade, getting net short. The Trend is Still Down. In 2014 many high beta tech stocks were taken down hard throughout the year and just haven't got up off the floor. 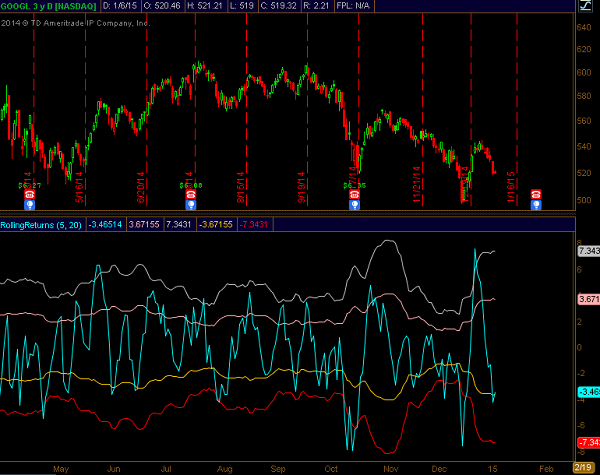 Even though GOOGL was strong in the short term, the risk/reward on any rally was to the downside. Bottoming patterns are processes, not one-off events. 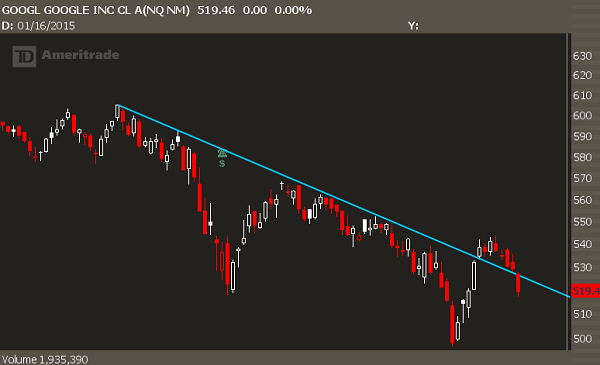 The first break above a trendline usually does not mark a change in trend. Instead, the stock will run for a bit more, then pullback, potentially make a higher low, and re-attempt the breakout again. This means price levels are not the same every time. I was bearish on GOOGL into 540 but if it hit that level again I wouldn't get short because it's already been tested once before. 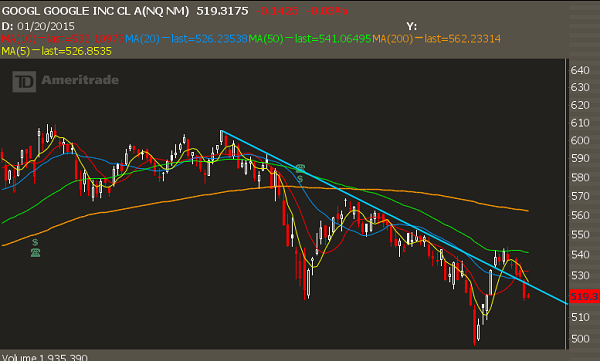 Just above the trendline breakout was a declining 50 day moving average. These levels don't always have to be major pivot levels, but considering that was the first retest since the breakdown in October, I had expected some funds to use that reference point as a level to lighten up. One study I use often is a "Rolling Returns" study. This simply shows the price performance of an asset over a certain time period. That rip higher left GOOGL with a return of over 7% in a 5 day time period. That was the largest move higher on a non-related earnings move in the past few years. Sharp bounces like that following a puke lower often stall out and back and fill. Given that the stock is still in a downtrend and there was a clear resistance level right above the breakout, it made plenty of sense to take this to the short side. I'm not a fan of shorting common straight up, especially when the stock is trading above $500. Instead, I chose to limit my risk by using bear call spreads. This is an option strategy that makes money as long as the stock sells off, doesn't move, or rallies just a little higher. I use scaling entries on spread sales as I can often be early so I would rather work into better fills and trade around a core position. This trade was sent out as an email alert to all IWO Premium members, and was also discussed in our Chat Room to make sure everyone understood the mechanics and risks in the trade. A few weeks later, the position was closed at 0.2, which means a total profit of 0.60 per spread. This equates to a 14% return on risk--a reasonable return and it was a high odds trade that produced reliable income. Want more trades like this? Become a member of IWO Premium Today. Click here to learn more.